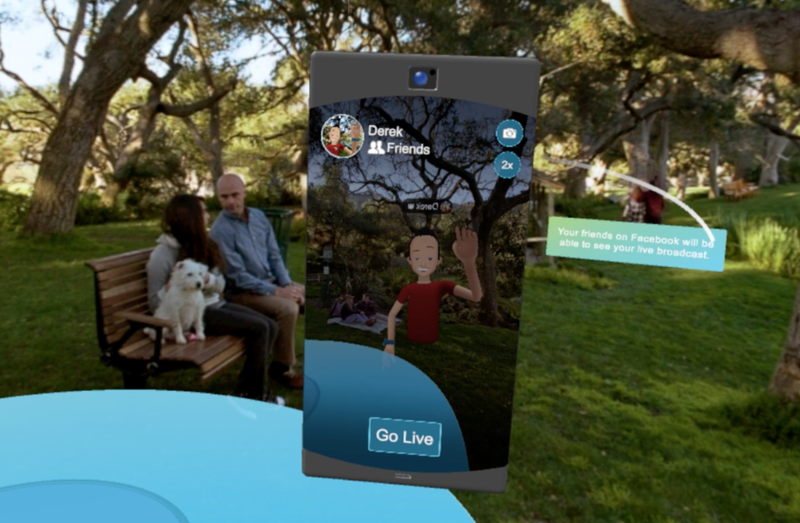 A few months ago, Facebook released an open beta of their new Spaces app, a virtual reality chat room that allows users to interact with others via a customisable cartoon avatar. A great range of Facebook features are available in the VR headspace with the opportunity to play games, watch videos and draw content all waiting there for you to enjoy. Now, in a new update that launched this week, the company has added another feature into the app in an effort to make the experience even more immersive - live streaming. Facebook Live is one of the more popular services that the company provides, although it's not without its controversy, and it's introduction into Spaces is likely to spur more people into using it. It functions in the same way as it does on the Facebook app, where going live will allow people to experience what's happening around you no matter where in the world they are. The difference with streaming live in VR is that you can position the camera wherever you want in the virtual space in either a real or animated setting. Friends who tune in to your broadcast can comment live and these can be physically pulled into the stream for everyone to interact with. "It's a huge network of people, places and things, so it's a question of how we present those things in VR and how we let people access them and interact with them, but it's also huge so there're a lot of things to figure out and explore." A problem that Facebook may encounter, though, is the popularity of virtual reality which most users don't currently own a headset for. They're hopeful that the introduction of the live streams will introduce VR to those who aren't familiar with it and entice more people to become involved, but the process may take some time to have much of an impact. The biggest appeal of virtual reality is what it can bring to a gaming experience, so those who aren't particularly active in that community are unlikely to invest in products by Oculus, the VR tech company that Facebook bought for $2 billion back in 2014. Given that users who don't own a virtual reality headset are still able to watch VR live streams from people they know, the company is hopeful this will do a good job in building up interest. However, with such a small group of people currently owning such products, it may take a while for that plan to gain some momentum.